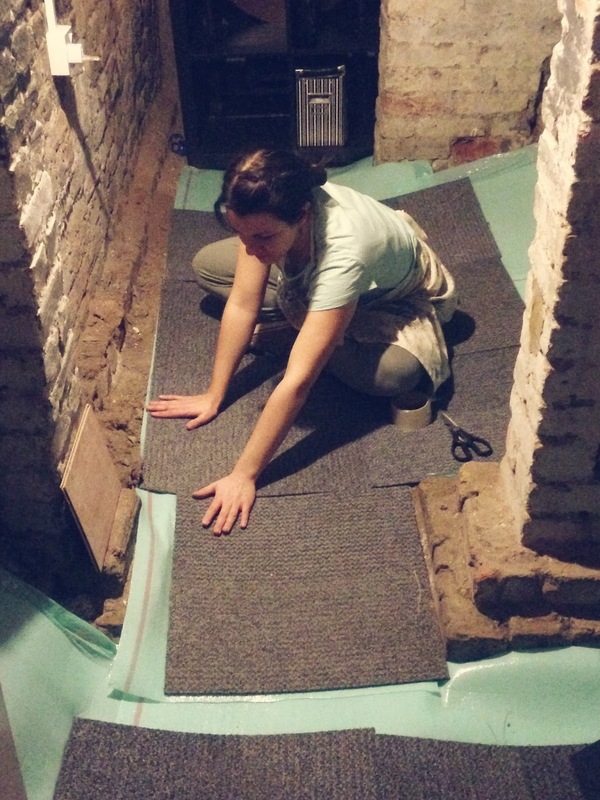 Today I would like to show you the transformation of the basement room in my house. 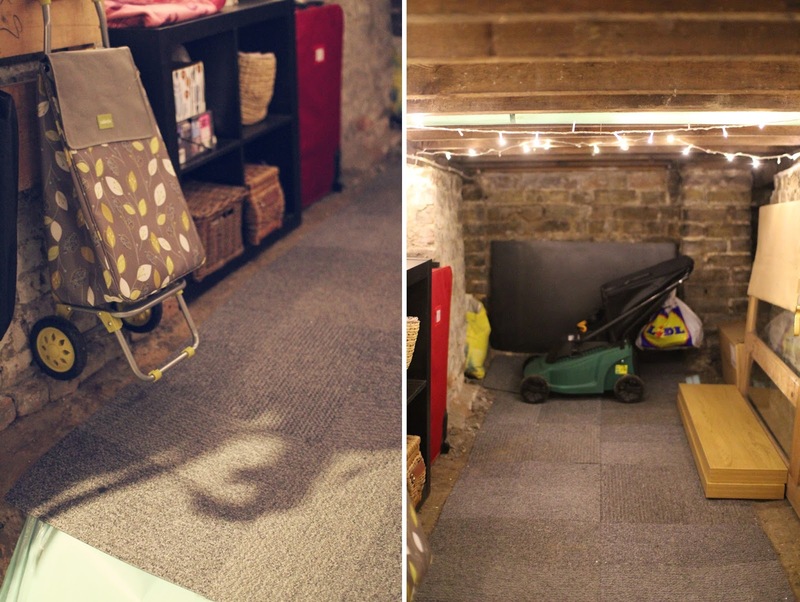 When we moved in we had this amazing catacomb looking basement under the whole of our house which was a size of the lounge and the bedroom all together. But it is quite low, like 165cm low approx.. at least I did regular bang my head if I wasn't careful. We started off by clearing all the rubbish and mess from the previous tenants and cleared it all out. This left us with old brick walls, sandy floorings and very uneven weird platforms. I guess this basement isn't really designed to be a room or a studio, but I wanted to create a good pleasant storage place. Because this place has a lot of column type walls (as basements should do)... it did block a lot of light, and one little light bulb wasn't enough. One area was lightened up and others were dark and spooky. I was quite scared every time I had to go there and every time I had to go back I was scared that some ghost will grab me by the hand and pull me in :) Some of the little zoned out areas weren't even designed to be used for anything, but those that were doable I decided to transform to a little, bright and lovely organised place. It all started at my working place where one of the managers came upstairs into our office part and said to some other person that they need to get rid of the floor carpet tiles as they are quite old. They were there for months and I always thought about putting them into a good use, but because they weren't mine I didn't touch them and I sort off constantly forgot to go and ask if I can take some home. So the good times came and I was given a permission to take as many as I wanted. 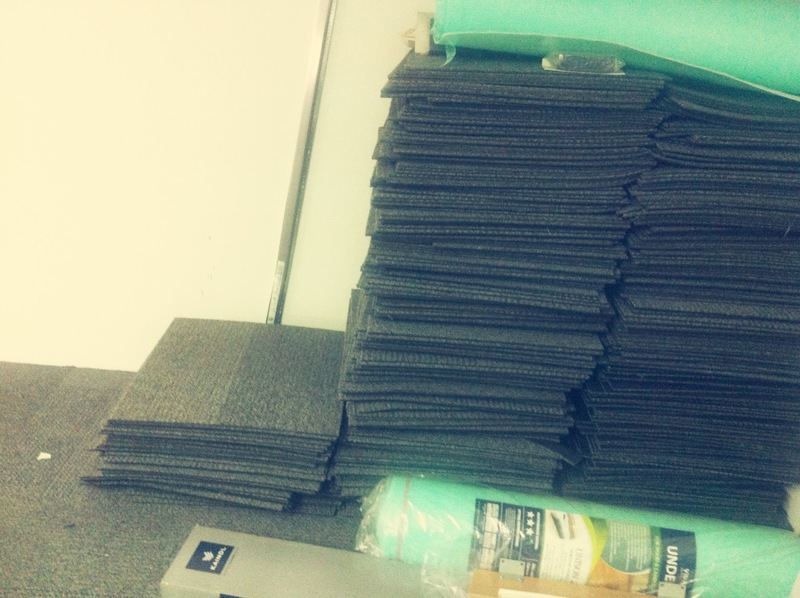 During the coming weekend me and Ash went to my working place and picked up some mint coloured under layer floor roll and about 40 of these carpet tiles. First I had to get rid of all our own stuff that we kept in there, like lawn mower, hoover and all that stuff. For the flooring we used large cardboard sheets and because the basement floor is pure hardened sand ( soil..) in some places it kept coming off, messing the whole place. That wasn't pleasant and it still is a problem, but inspire of that I think I managed to refurbish the floor in far more comfortable, less slippery and sandy surface in a nicer colour and a better feel. In some places I even had a chance to nail the floor to the actual ground. I know it's not how builders do it, I know you should put concrete first and then when you have a normal floor you put all the insulations, all the hidro protective layers and then carpets, but neither I have money or permission to do so. And besides with such low ceiling who would want to put concrete in such useless place. Place already had some old rush nails, some weird wooden panels filled with rusty nails again and so I had to do a lot of work to pull the all out. I know you will ask me what was Ash doing, but you should know one thing about me. As an Architect's assistant and Interior designer by education, I always since very childhood liked all sort of stuff like building, putting furniture together and stuff. I know it's traditionally a manly job, but if I can lift it or move it or screw it myself, than give it here, I will to it! It's like lego :) I like the process of creation in any of it's possible ways. You should be sure that Ash did help me with all the heavy bits but I purposely didn't let him in the basement for two days after he did all the heavy job. I wanted him to see a magical transformation in whole when I would be done. As you can see we even put some furniture there. We had quite a few unneeded bits of furniture in the house and so we kept those in the basement. They were our past Ikea unit shelf collections which we accumulated during the past 3.5 years. So I am glad it all came up handy in the end. The place is actually rather dry. Somehow there is not much mouldy spots, only near the ventilation holes there is a bit of tree roots, but that's far away from the little storage place. I placed some hooks in the ceiling wooden beams to hand stuff if needed and I also attached a few smaller hooks on the wooden board that was already there so I can hang my shopping trolley and photography bags, tripods and stuff. I even hanged some nice decorations which couldn't find a place in the house. And the old door here is being used as a wooden panel that block all the crappy stuff from the little storage room. Here you can see the floor job I did. I think it's even enough according to the fact that I didn't even even out the floor or anything. I just put the mint coloured protective under layer and placed the floor tiles on top of it. Nailed them to the floor afterwards :) They can be ripped off easily, but long nails stop it from shifting. I also did stick them together with a tape on the other size. This way it's like one long line of carpet. Holds itself in place. And these are little detail shots of other items kept in there. A little name tags Courtney and Chris gave us on their wedding came very useful and zones out the space just right! Thank's guys!